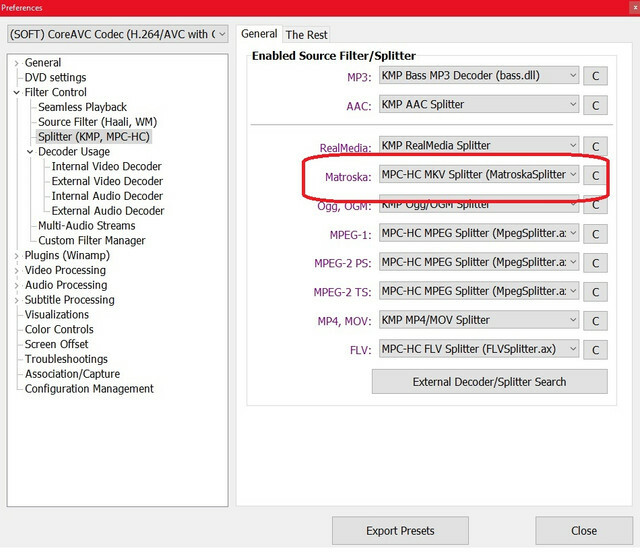 Notice under video info it says : DECODER > NO CODED. Why do you think is that? I know if I install later versions of KMPLAYER I can easily play those videos, but I'm trying to get this version of KMplayer to play them. Using Haali as a source filter is a problem. change it to LAV source installed by my codecs. That old version of the Matroska splitter is also a problem. change it to LAV splitter installed by my codecs. I have never used this player but that Haali setting may be why you cannot change other settings. Haali's filename is splitter.ax - maybe find that file and add .old to the end of it. Renaming it will keep it from interfering with playback. Maybe you need to use the button at the bottom to search for external splitters and decoders. All should be set to use LAV.